How Do Public Libraries Contribute To Our Wellbeing? 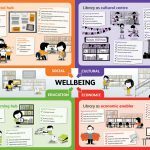 This leaflet sets out the range of ways in which public libraries impact on four policy areas – economy, education, culture and society – and how libraries contribute to the wellbeing of individuals and communities. To view the online version of this leaflet, please click here.